Home / Electrical / How a rotor rotates in DC motor. 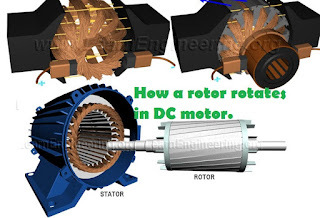 How a rotor rotates in DC motor. DC motor operates with a basic theory- A current carrying conductor will experience a force when placed in a magnetic field. The conductor can be any metal—iron, copper, aluminum, and so on. So we need the these things for motoring action- A current carrying conductor that will feel the force- (the rotor – in this DC case called Armature), a magnetic filed (stator provides field), a setup to vary current in armature or rotor such a we to make a rotary motion. (Fixed brush and rotating commutator setup). [alvaa]As discussed above an electric motor must harness this force exerted due to relative motion in a magnetic field – in such a way as to cause a rotary motion. This can be done by forming the wire in a loop and placing it in the magnetic field (image).The loop (or coil) of wire is allowed to rotate about the axis shown and is called the armature winding. The armature is placed in a magnetic field called the field. The commutator and brushes supply current to the armature while allowing it to rotate.